What is a Honda CT? The CT is Honda's model designation for the line of original dual sport motorcycles (used both on pavement and off-road), referred to as Honda Trail Bikes. 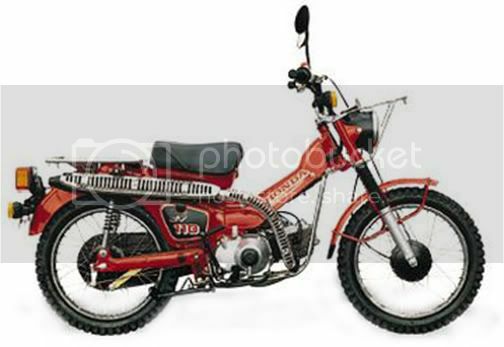 Initially CT's were only created in a full size version, however, in later years, several small CT's were introduced that are referred to as Honda Mini-Trail Bikes. The full size CT gave fishermen, hunters, campers and explorers an affordable and reliable means of backwoods/off-road transportation that provided fun and excitement as a bonus. The story goes, when American Honda saw that a certain dealer, in a very rural area in the Western, United States, was selling a lot of Honda Super Cub 50's, American Honda wanted to know why that was happening, as they did not think the Honda Super Cub 50 was very well suited to a rural area. When American Honda investigated the phenomenon, they found that this dealer was adapting a larger rear drive chain sprocket (for low gearing to climb hills and mountains) on the Honda Super Cub 50's and removing the front fender to make them more off-road worthy. After seeing this, American Honda was inspired to offer a more off-road worthy Honda Super Cub 50, thus the Honda Trail 50 was born. Production and sale of CT's has continued after 1986, with sales in other countries around the world. It has been speculated by some CT'ers, that American Honda discontinued importing the CT's into the United States, because of the increased popularity and sales of ATV's (read about ATV's) or because of stricter emissions regulations (read about the History of Motorcycle Emissions). Some CT'ers hope that American Honda will "see the light" and will start importing the full size CT's into the United States again. There is an undeniable positive characteristic to owning a brand new motorcycle, one that no previous person has messed up. However, there is also the idea of being able to ride something that isn't widely available to a large group of people. Even with the large number of CT's that were imported into the United States, their numbers are dwindling over time, as they get discarded, neglected or outright destroyed. CT'ers seem to be individuals willing to learn something about and be able to repair, refurbish, restore and maintain their unique original dual sport motorcycle and they seem to enjoy the reward of having something very unique, different and special to own and to ride. So, no matter if you purchased a pristine CT, that needed absolutely nothing done to it (be sure to say "thanks" to the previous owner), or if you purchased a "wrecker" that needed a complete rebuild, including painting the bare frame, this is a neat little motorcycle and its owner's are proud to call themselves, CT'ers. What is unique about a Honda CT? The characteristics described below are what make full size CT's unique. The full sized CT's are built upon the classic "Super Cub" model of Honda motorcycles. It has been speculated by some CT'ers that the CT stands for "Trail Cub" and there is some evidence to support this, as other Honda motorcycles follow this convention, such as the Trail Sport - ST90. A notation from the Honda Collection Hall web site also has a reference to a Honda Hunter Cub, based on the "Super Cub 55". Super Cubs, and thus, CT's feature a "Step Through" design, where the gas tank is under the seat. This "Step Through" design was particularly well suited to going slow on rough trails where climbing off the CT was easy by swinging the rider's leg through the opening where a regular motorcycle's gas tank would be. CT's have single cylinder engines that are often referred to as "horizontal engines" as the cylinder is pretty close to horizontal in reference to the ground, as compared to most other motorcycle engines that have their cylinders more vertical. There are exceptions. Almost all full size CT's have an "Auto-Clutch", which requires no clutch lever on the handle bars. The auto-clutch engages when the engine rpm's are above idle, this causes the centrifugal force of the auto-clutch to engage the clutch mechanism. When idling on flat ground, the clutch is not engaged, thus the CT does not move. Shifting is accomplished by quickly backing off the throttle, pressing the shift lever (either up shifting or down shifting) and then opening the throttle again. The auto-clutch feature was particularly nice as it allowed the rider to stop anywhere, even on a steep or rough trail by holding the throttle open "just enough" to hold the position on the hill, without the use of brakes. Once the throttle is opened farther, then the auto-clutch engages and the CT accelerates smoothly away from the stop. A dual speed sub-transmission (often referred to as the high/low gear box). Both set-ups provided 8 speeds, 4 speeds in low and 4 speeds in high. There are exceptions to CT's having a low speed range. It's the 1980, CT110, in the United States, and most CT's purchased for postal delivery service by governments in other countries. These CT's only have 4 speeds in high gear. Some CT'ers have speculated various reasons why the 1980, CT110 that was imported into the United States did not have the dual speed sub-transmission, with the most common idea being that Honda thought the low speed option was unnecessary with the extra power of the newly introduced CT110 engine. It is also speculated that customers didn't like it and protested, thus Honda brought back the dual speed sub-transmission in 1981. It's important to note that these CT models were not designed to have the low speed capability, and it is not possible to just add a dual speed sub-transmission to one of these engines, as these are a different engine case. However, it might be possible to use the large overlay rear sprocket on these CT's (I do not know of anyone that has tried this) or these models can be retrofitted with a newer CT engine that has the dual speed sub-transmission already built in (the engine mounting bolt positions are the same). The low speed range is used when going slow or over steep terrain, usually off-road. When using the low speed range in first gear, it feels like you could climb a tree. You might be tempted to try pulling heavy objects in low range, resist this temptation, it is not a safe activity. Do not "over rev" the engine when using the low speed range, watch your speedometer needle in reference to the special low speed range shift indicator lines and the top speed mark. If you think you can go faster in low speed range, fourth gear, then it is time to either, switch to the high speed range or take a break from riding, to relax, before you either hurt yourself or the CT. The high speed range is for normal travel speeds, either on a good dirt road or on pavement. Top speed for most CT's is around 50 - 55 mph. The large overlay rear sprocket, required some time to change from high to low (or back again), by undoing the master link in the drive chain, changing the large sprocket from its storage mount location (towards the spokes, a place that did not require the removal of the rear axle to change from low to high or from high to low) to its drive location on the normal high gear drive sprocket, bolting the large overlay rear sprocket in place with 4 bolts and washers, adding a small drive chain extension segment to accommodate the large overlay sprocket's bigger diameter and then reconnecting the master link on the drive chain. The dual speed sub-transmission only required coming to a complete stop, shifting into neutral, flipping a lever on the dual speed sub-transmission housing, checking the engagement of the dual speed sub-transmission and then continuing to ride. This was a big improvement and a very desirable feature. The full size CT's were the first motorcycles to have a factory installed "engine guard", now commonly called a skid plate, to protect the engine. This was a leading innovation that lives to this day in the world of dual sport and off-road motorcycles. This was a valuable piece of equipment in trail riding. The suspension on full size CT's are only slightly beefed up versions of the suspension found on the Super Cub. Wheel travel is not that great, but the full size CT was not designed, back in its time, to do the things modern motorcycles are expected to do. Full size CT's were not designed to do jumps. Every now and then, a heavy rider will feel the suspension bottom out. The early CT's have a bottom link front suspension with very little travel and the later years of CT's have telescoping front forks, with increased travel. Almost all full sized CT's have an "up swept" exhaust pipe with a U.S. Deptartment of Forestry approved spark arrestor and an intake for the air cleaner that was also mounted high on the frame (usually under the rear cargo rack). This allowed the CT to cross streams, where most of the engine was covered in water and the engine kept on operating. Upon emerging from the water, the engine produced a lot of "steam vapor" as the water evaporated off the engine, however, no damage was done. The seat on a full size CT was for solo rider use, and the stated load rating of a CT is 200 lbs. The solo rider seat allows for the large rear cargo rack to carry a lot of items, most often camping equipment. Interestingly enough, Honda sold a "Buddy Seat" that could be mounted securely on the rear cargo rack to carry another person and some large CT's came standard with "Buddy Foot Pegs" mounted to the rear swing arms. This might indicate that the CT could hold more that the stated load rating of 200 lbs., or that both rider and passenger were to be of "slight build" and didn't total more than 200 lbs. It's important to note that excessive weight on a large CT is not safe. The full size CT's were also the first motorcycle to have folding foot pegs that would spring back into position after they brushed against an obstruction. This allowed the rider to keep riding, where normal foot pegs might make the motorcycle come to a complete stop in a similar situation. The later year, full size CT's came standard with large rear cargo racks. The early CT's were the exception with a very small rear cargo rack. These large rear cargo racks have changed slightly in design over the years; some are totally flat, some have a rear stop bar (to keep items from sliding backwards), some have tie down pegs under the rack for elastic bands, bungy cords or hooks/loops on a small spyder web cover. Honda designed a front cargo rack in later years to fit above the headlight, in front of the handle bars, to carry additional light/small items. While this design came out after Honda stopped importing the large CT's to the United States in 1986, the front cargo rack is a popular option for retrofitting. This front cargo rack adds to the rugged look of the full size CT's, however, is only available for full size CT's with telescopic front forks. Quite a few full size CT's have a handle bar release lever, that allows the handle bars to rotate �90�, for easy transportation on a bumper rack, either on the front or back of a motor home, truck or car. This is very nice, as the width of the CT is reduced significantly, making it easy to fit on the bumper rack and keep the weight of the CT, close to the vehicle on which it is transported. In later years Honda designed an auxiliary - spare gas tank to be mounted on the left side of the rear fender. This also incorporated a helmet holder for locking the rider's helmet in place. The auxiliary - spare gas tank was convenient for longer trips where gas stations were not present. Full size CT's came in the colors of Red, Yellow and Orange, in various years, with the colors having some slight changes over the years (Monza Red and Scarlet Red, or Summer Yellow and Bright Yellow, as examples). Honda never produced any full size CT's in any other colors, so if you see a full size CT in blue or green or black or any other color, it's an owner produced color (there are some neat ones, "out there") or it could be a Cub or SuperCub, either mistaken for a CT or one modified by an owner to look more like a CT. The Honda Mini-Trail Bikes came in all sorts of colors. The plastic components, such as side covers, the downtube cover and the headlight bucket, were made by Honda in the colors of Red, Yellow, Orange, Grey, Silver, Black, and White. There are some reproduction, after market, plastic components in other different colors. Honda certainly knew the market for the Honda Trail Bikes. Most of their advertising indicated that Honda Trail bikes were "loaded" and "no extras needed", much to the dismay of after market motorcycle accessory maunfacturers. Questions, comments or corrections, please see "Sending Us Info". Visit our own CT Gallery for CT common specifications, with a narrative about yearly information, data in a table format and full color photos showing CT details for each year of CT imported into the United States. The is also a downloadable PDF, text only document for your personal PC storage and printing. See the menu on the left for the CT Gallery. This link to The Honda Gallery web site will take you to main web page, once there you will need to look around to find the models below. Just for fun, here are some other Honda Trail Motorcycles that were manufactured. And, just discovering what's contained in the rest of The Honda Gallery, is great fun!